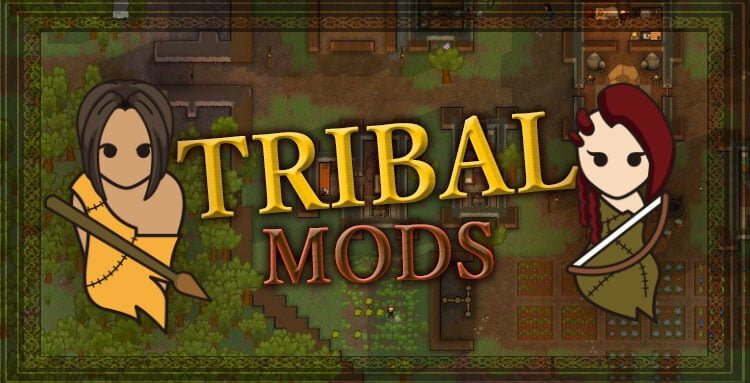 The Tribal Reborn Mod adds new tribal items for those players who want to play a tribal scenario and don’t want to rush into research. It includes joy items, production spots for butchering, brewing, art, tailoring, stonecutting and researching, a smokepit, a stone oven, psychoid tea, cooked eggs, popcorn, and art, apparel, walls and flooring. Basic workbenches are now attached to a “Work Benches” research that isn’t given to tribal groups at game start, making the “primitive” versions of those benches more useful. New apparel: Woven Hats and Cloaks (made from dried grass or pounded bark); Muffalo Headdress (an impressive hat which yields a small Social boost); Tribal Helmet (a wooden tribal helmet that requires “Tribal Warfare” research); Tribal Armor (a tough hide coat with wooden slat armor that requires “Tribal Warfare” research). New furniture: Double Sleeping Spot (for couples); Storage Box (a place to hide ugly items or to protect perishable items from the elements). New items: Cooked eggs (since you can’t use eggs in pemmican); Crafting Basket (a tribal version of the toolchest, made from hay, which boosts production speed); Large and Small Rugs; Large and Small Totems; Patchwork Leather (a low quality leather patched together from scraps at a crafting spot); Popcorn (gives joy, but not much nutrition); Psychoid Tea (a social drug that can also help fight disease); Smoked meat (preserved meat, which can be eaten “as is” or made into pemmican); Urns and Decorative Pots. New joy objects: Three Stones Game (a tribal version of chess); Tribal Lore Fire (a place for tribals to gather, share stories, and gain a small Social skill boost). New production: Art, Brewing, Butchering, Researching, Stonechipping and Tailoring Spots; Smokepit (a small fire used to make smoked meat); Stone Oven (a primitive oven, better than a campfire for cooking food). New security buildings: Earthen Mounds (more protection than rock chunks, but not as much as sandbags); Pitfall Trap (a deep pit with sharp spikes that requires “Basic Traps” research). New walls and floors: Barn Board Floor (uses less wood to build); Log Walls (like wood walls, but with a log texture); Rough Paving (uses less stone to build); Random Paving (requires “Stonecutting” research). Additional credits: RimRue, the original creator of this mod for A17. The mod also borrows bits and pieces from 3DGrunge (Tribal Armor Breastplates), Bacon Bits (Pitfall Traps), CuproPanda (Earthen Mounds), ItchyFlea (Log Walls), MasterDihtung (Pottery), Mouf (Psychoid Tea and Patchwork Leather), Tammabanana (Smokepit), Telkir (Stone and Wood Floors) and TrueDestroyer (Double Sleeping Spot). 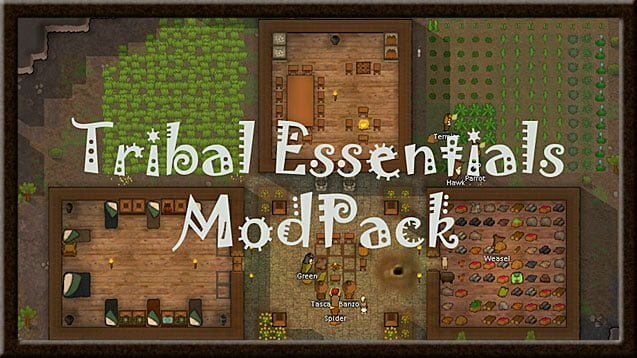 The Tribal Essentials Mod is one of the mods you can’t play without if you are going for a tribal run. Forget about tech advancement and enjoy the ride with plenty of new things to focus on with Tribal Essentials.